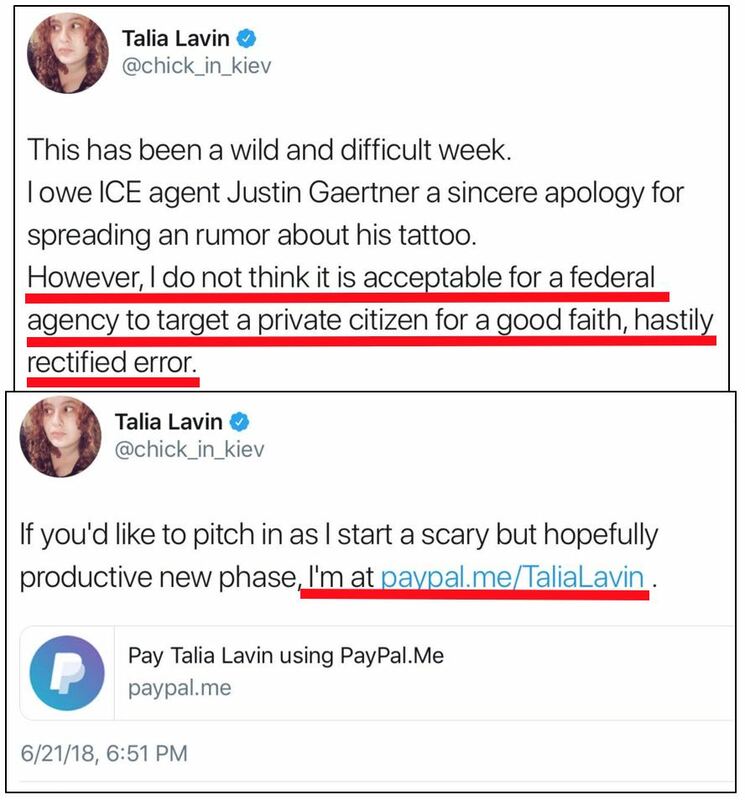 On June 19, Alec Sears at NewsBusters covered then-New Yorker Magazine "fact-checker" Talia Lavin, who posted a now-deleted tweet about a photo of Justin Gaertner, a combat-wounded war veteran and computer forensic analyst for the U.S. Immigration and Customs Enforcement agency. She falsely claimed that a tattoo on Gaertner's elbow was a Nazi Iron Cross. Per ICE, it really is a Maltese Cross, the symbol of double amputee Gaertner’s platoon in Afghanistan, Titan 2. Despite her tweet's deletion and her apology, Lavin's subsequent conduct shows that she hasn't learned a thing. Malkin then found evidence of Lavin's unhinged mindset, one which clearly set up her to assume the worst about anyone on what she considers the other side, in a June 12 column at The Forward. Lavin has since resigned from the New Yorker on her own volition. She also set up a PayPal account to crowdfund her salary. Additionally, Lavin, who as of when Malkin drafted her column had "turned her Twitter account private," is now back, and as awful as ever. So according to Lavin, ICE, whose Homeland Security Department is so concerned about harassment and violence against its employees that its acting Deputy Secretary has warned of "a heightened threat" against them, should have ignored her smear. In other words, they're just supposed to sit there like cowards and not stand up for their employee while a blue-check member of the media acts recklessly and irresponsibly. As Malkin tweeted on Friday, this (combined with begging for money as some kind of martyr) is "The definition of chutzpah." Reacting to a Washington Post editorial's call, after the Sarah Sanders-Red Hen Restaurant incident in Lexington, Virginia, to "Let the Trump team eat in peace" — "They can eat in peace in their own damn houses" (Tell that to Kristjen Nielsen, ma'am — Ed. ), and "oh no, the fascists concertedly stripping away our rights might have to brown bag lunch. we should be more submissive. direct anti fascist action is so gauche." "i feel like being conservative is the new whites only." "being polite to fascists won't make them want to destroy you less. it's just lying down so their boots can crush your face more conveniently." That's before getting to what she's eagerly retweeted. Sadly, in today's establishment press environment, Lavin's tweets may be resumé enhancers.